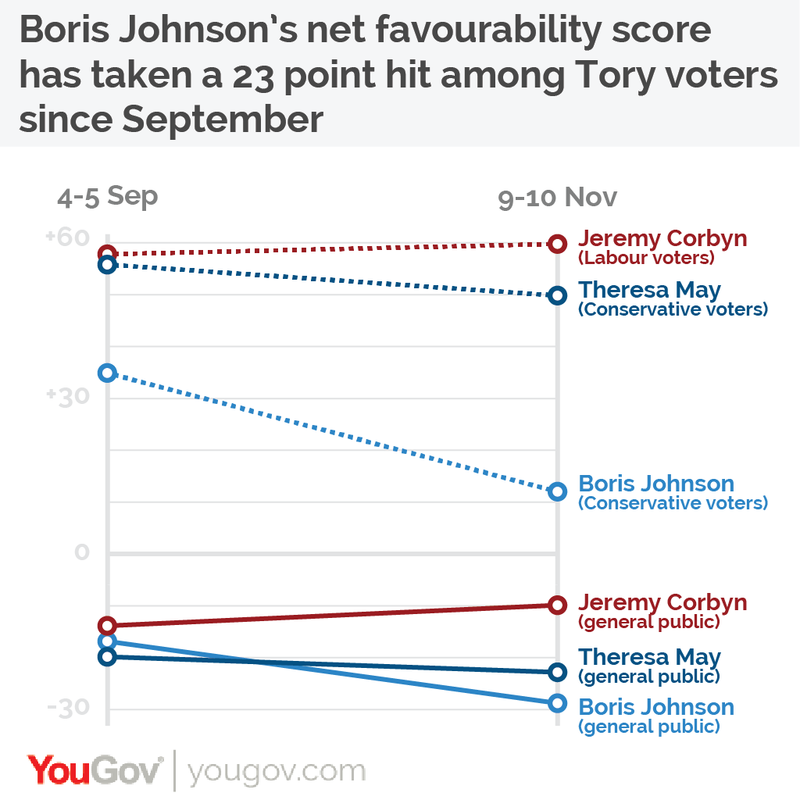 November 14, 2017, 9:55 a.m.
YouGov’s latest favourability tracker survey reveals that Boris Johnson’s net favourability score has declined among the public, and taken a big hit among Conservative voters. While Boris had a net favourability score of -17 among the general public in early September, this has since diminished to -29, while his net favourability score among Conservative voters has slumped from +35 to +12. Currently, 28% of the general public have a favourable view of the Foreign Secretary while 57% hold unfavourable ones. Among 2017 Conservative voters, 52% have a favourable view of Boris while 40% hold unfavourable views. The results follow the Foreign Secretary coming under fire for the way he has handled the case of Nazanin Zaghari-Ratcliffe, a British-Iranian woman who faces seeing her prison sentence in Iran extended after Boris said that she had been in the country training journalists. However, it is impossible to say how much of the change from two months ago can be attributed to the Zaghari-Ratcliffe case alone. Since YouGov&apos;s last favourability scores the Foreign Secretary has: generated negatives headlines following a poorly-received joke about dead bodies in Libya, had a public tangle with the UK&apos;s chief statistician over the Leave campaign’s pledge to spend £350m a week extra on the NHS, and been accused of undermining the Prime Minister&apos;s Florence speech by writing a 4,000 word article setting out his vision for Brexit and subsequently allowing speculation to mount that he would resign if May&apos;s speech did not match closely enough with what he was calling for. The latest favourability figures place the Foreign Secretary further behind Theresa May among Conservative voters. In September the Prime Minister held a 21 point net favourability lead over Boris, which has since almost doubled to 38 points with May holding a +50 net favourability score compared to Boris’s +12. (By comparison, Jeremy Corbyn has a net favourability score of +60 among Labour voters). 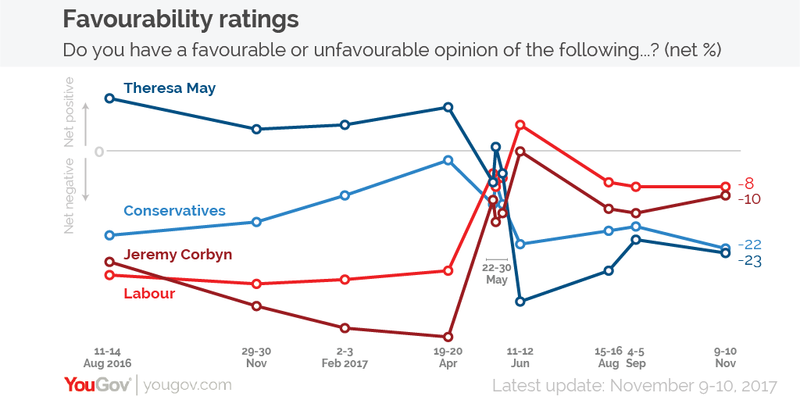 In the battle between the two party leaders for the affection of the general public, Jeremy Corbyn maintains his net favourability lead over Theresa May, although both leaders still hold negative net scores. At the time of the previous poll Theresa May’s score was still on a recovery trajectory following her post-election low of -34 in June. This now seems to have been arrested, with the Prime Minister’s current net favourability score of -23 about the same as it was in early September (-20). Likewise, Corbyn’s latest score of -10 has remained essentially unchanged since mid-August, when it was -13.